Got this used in 1993 with 30,000 miles on it. Now it has 150,000. 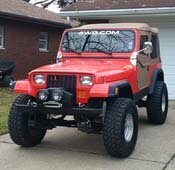 It has a 4 inch suspension lift, 1 inch body lift, 35 inch tires, Aussie locker in front, TJ front axle shafts, and a Bestop Supertop.